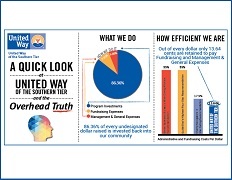 With your help, United Way of the Southern Tier is able to support the critical programs and services in our community. More than 200 workplaces hold annual giving moments throughout Steuben and Chemung counties. In large part, it is because of these companies and Giving Moment Coordinators that United Way of the Southern Tier is able to support the critical programs and services in our community. Providing the opportunity for your employees to get involved in our community through donating to the United Way allows them to participate in causes that matter to them most. Nevertheless, the workplace campaign is about more than raising money for worthy causes; it also strengthens connections between employees and their community and allows them to be a part of a larger mission to create a thriving community. On behalf of the people who will benefit from your hard work and generous gifts, thank you. It takes people like you who join hands, open their hearts, lend their muscle, and find their voice to influence the condition of all. Thank you for thinking of we before me. 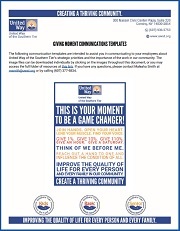 In this 7-page guide, you will find communication templates to help you share the value of United Way with your colleagues. We hope you will use this guide as a go-to resource for your giving moment communication needs. This dramatic poster illustrates the social issues that affect our community. We win by living united. By forging enduring partnerships. By finding new solutions to old problems. By engaging the best resources. And by inspiring individuals to join the fight against a common foe: our community’s most daunting social needs. 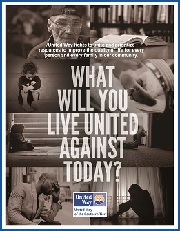 What will you LIVE UNITED against today? United Way concentrates it's support on three main strategic focus areas: Kids on Track, Basic Needs, and Senior Supports. 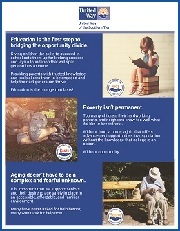 Use this poster to help educate your coworkers on United Way's priorities and start conversations about what areas have meaning to them. United Way works with many different partners to improve the quality of life for every person and every family in our community. This 8.5” x 11” poster contains all of our current partners supported through the Game Changer’s Fund. Have you, or people you know, wondered where the money goes? Great! We love that you care so much about our community. We do too, which is why we strive to be as effective, efficient, and transparant as possible. This 8.5” x 11” poster demonstrates what we do and how we do it. For more information on hosting a workplace giving moment, or questions, contact Stephen Hughes.